Pack of 5 Lighthouse Vario 2 Pocket Black Stamp Stock / Photo Album Pages. Lighthouse Black Vario pages are made of unplasticized PVC with no chemical softeners or acids. 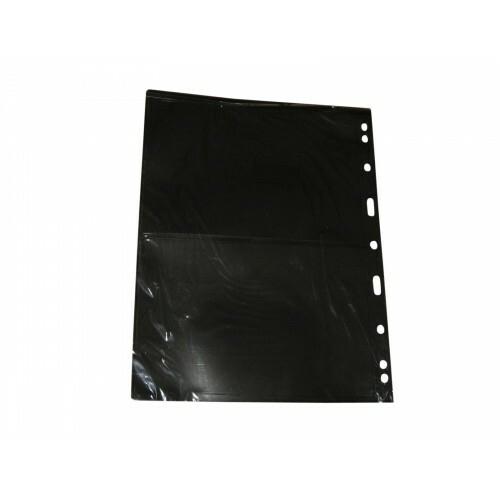 This material is similar to what's used in trading card topload holders or card savers, but thinner. It is safe for long term storage and will not migrate or damage your collectible items. Lighthouse Black Vario pages have pockets on both sides of the page with a black middle sheet to separate them, so they have double the capacity of similarly sized clear sheets. They feature a series of 9 holes down the left side of the page which allow them to fit into most 3, 4, or 5 ring binders (sold separately). Pockets load from the top. External Dimensions (Overall Size) : 8-1/2" x 11"
Great for papers item such as large banknotes, 5x7 photos, stamp sheets, oversize postcards, etc. 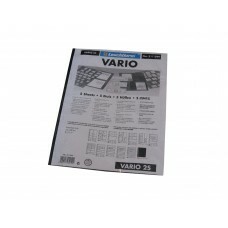 Do you have any questions about 5 Lighthouse Vario 2 Pocket Black Stamp Stock / Photo Album Pages binder sheets?